I think you may not have heard of classical Mechanics or Newtonian mechanics, they deal with the study of the motion of macroscopic objects under the action of force or a system of forces.The classification of classical mechanics includes statics, dynamics, kinematics and kinetics. 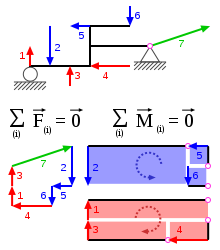 As you already know that, the branch which deals with the study of rest or motion caused due to the action of forces on the bodies is called mechanics.Here I am going to teach you about classical mechanics.The classical mechanics are also called as Newtonian mechanics. Statics in newtonian mechanics is the study of forces and conditions of equilibrium of bodies at rest, which is acted upon by a system of forces.Here the body is at rest or the centre of mass moves at a constant velocity. We know that the acceleration of the particle is zero.Therefore the force becomes zero in the above equation.This implies that the total forces acting on that body will be zero.By this condition, we can find all other unknown forces acting on the body. the angular acceleration is zero, hence the summation of moment acting on a static body also will zero. It is the branch of mechanics which deals with the study of motion of the rigid bodies and the forces acting on them.The dynamics of classical mechanics is divided into kinematics and kinetics.Here the force and moment are not zero. Kinematics deals with space, time relationship of a given motion of a body and not with the force that causes the motion of that bodies. Kinetics is the study of laws of motion of bodies under the action of forces or we can say that kinetics is the study of the relationship between the forces and the resulting motion. Hope you can understand types of mechanics, statics and dynamics well.Please do check all other posts on this website. ← 10 Factors You Should Check During Site Selection for Reservoirs and Dam While Surveying.